As of yesterday’s market close, the Dow crushed its previous record milestone time frame by adding 1000 points to the index in just 8-trading days. 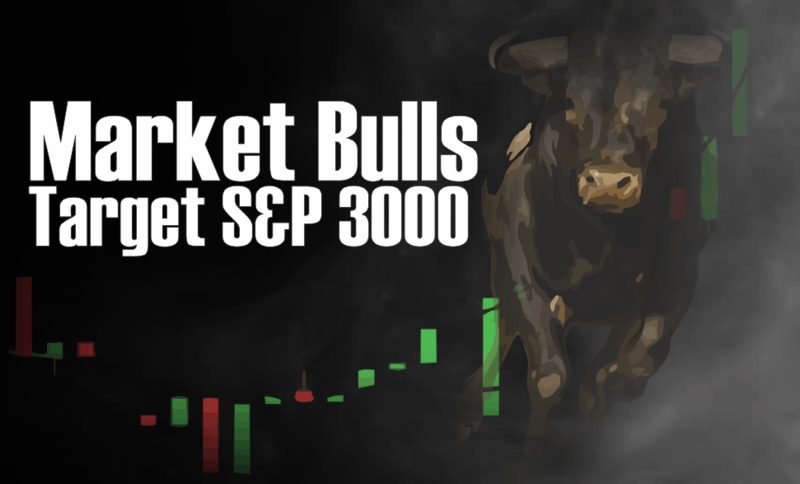 The S&P also rose to 2800 at a record pace adding 100-points in just 10-days. It is starting to go parabolic. With investors now betting on a sharp rise in earnings to reduce the current levels of overvaluation, the seems to be little in the way of the next major milestones for 30,000 for the Dow and 3000 for the S&P 500. The above chart has been updated for that momentum. Just remember, bull-runs are a one-way trip. Currently, there are just 200 points of upside until the S&P 500 hits a majority of its Wall Street targets of 3000. I have taken the chart above and calculated several possible corrections and mean reversions to different levels. When comparing the probable levels of even a mild correction, 200-points of upside currently hardly justifies the risk being undertaken by investors. This is particularly the case given one of the most extreme overbought conditions of the market in its history. It’s easy to get wrapped up in the bullish advance, however, it is worth remembering that making up a loss of capital is not only hard to do, but the “time” lost cannot. The point is while the media and bulk of the commentary continue to “urge you to ride the bull,” they aren’t going to tell you when to get off. In the end, being right or wrong has no effect on the media as they are not managing your money nor or they held responsible for consistently poor advice. However, being right, or wrong, has a very big effect on you. If you are going to “ride this bull,” just make sure you do it with a strategy in place for when, not if, you get thrown. The combined overbought, over-leveraged condition of the financial markets is of extreme risk to investors currently. While the bullish trend remains intact currently, it is extremely prudent to perform some risk management in portfolios. It is worth remembering that portfolios, like a garden, must be carefully tended to otherwise the bounty will be reclaimed by nature itself. If weeds are not pulled (sell losers), they will choke out the garden. If the soil is not fertilized (savings), then the garden will fail to produce as successfully as it could. 1) HARVEST: Reduce “winners” back to original portfolio weights. This does NOT mean sell the whole position. You pluck the tomatoes off the vine, not yank the whole plant from the ground. 3) FERTILIZE AND WATER: Add savings on a regular basis. A garden cannot grow if the soil is depleted of nutrients or lost to erosion. Likewise, a portfolio cannot grow if capital is not contributed regularly to replace capital lost due to erosion and loss. If you think you will NEVER LOSE money investing in the markets…then STOP investing immediately. 4) WATCH THE WEATHER: Pay attention to markets. A garden can quickly be destroyed by a winter freeze or drought. Not paying attention to the major market trends can have devastating effects on your portfolio if you fail to see the turn for the worse. As with a garden, it has never been harmful to put protections in place for expected bad weather that didn’t occur. Likewise, a portfolio protected against “risk” in the short-term, never harmed investors in the long-term. With overall market trend still bullish, there is little reason to become overly defensive in the very short-term. However, I have this nagging feeling that the “spring” is now wound so tightly, that when it does break loose, it will likely surprise most everyone.